Other rappers have conjured alter egos, but it’s hard to think of any that exists wholly on their own, with little connection to the author’s back story. Neither Daniel Dumile’s super-villain MF Doom (or Metal Fingers, King Ghidra, et cetera) nor Madlib’s helium-voiced Quasimoto embody a fantasy as densely constructed as Kenny Dennis. It gets odder and more exhilarating with each fresh telling, and Serengeti’s approach to the character is akin to literary tragi-comedies like Victor Lavelle’s The Ecstatic. 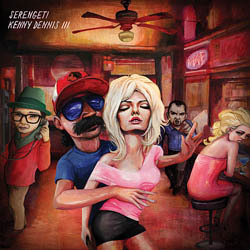 Each chapter has its thrust: 2012’s Kenny Dennis EP was a blitzkrieg of pseudo-boom-bap fast-rap led by his fantastic imaginary dis of Shaq Fu (“Shazam”), and 2012’s mini-album Kenny Dennis LP centers around a doomed road trip to California for Kenny’s 50th birthday. At 45 minutes, Kenny Dennis III is the character’s lengthiest and most poignant adventure to date. Serengeti’s crusty, heavily affected Chicago-ese accent lends verisimilitude, but it can also make his litany of hyper-local references difficult to parse, at least for those of us unlucky to call the Windy City home. So his skits with featured star and Workaholics Anders “Ders” Holm, who plays struggling actor and Kenny Dennis fan Ders, prove instructive as well as some of the funniest moments on the album. The plot is that Kenny Dennis and Ders form Perfecto, modeling it after 90s pop fads like Technotronic and C&C Music Factory. Hilarity ensues as the duo, clad in Aeropostale mall gear and cut-off cargo shorts, cram into an Aurora and embark on a tour of “rec centers across the Midwest,” with a battle-of-the-bands showcase at Minneapolis’ Mall of America hosted by Joe Simpson (of Jessica and Ashlee Simpson infamy) as the ultimate prize. But a bizarre acting opportunity for Ders, revealed on “Mr. Drummond,” derails Perfecto’s freestyle dance-pop revival. Undergirding the weirdness is Odd Nosdam’s droning loop hallucinations, from a scratchy rock guitar break on “No Beginner” to the haunting organ keyboard freak out of “Lose Big.” His esoteric taste in breaks matches Serengeti’s lyrical range. As the rapper tells a vignette about his would-be thugging little brother “Tanya T” staying with him, he describes eating dinner, “meatloaf and mashed potatoes/ On the table/ Watching cable/ Code of Silence/ Chuck Norris in the flick, it’s violent.” But he tends to repeat himself, whether continuing to romanticize his “battle” with Shaq Fu (“Bumped into Shaq, [he’s] too scared to battle,” he says on “Damn Dz”) or chanting the same phrase over and over, like “Buddy Guy.” It’s an annoyingly hypnotic idiosyncrasy that’s not necessarily limited to his Kenny Dennis material – he employs the same trick on his “normal” recordings like 2010’s Family&Friends. Here it helps illustrate this aging hip-hop knucklehead. The fact that KDz hails from the hip-hop’s second golden age was initially part of the joke. Anyone who has enjoyed the genre long enough has tolerated those middle-age old-timers, still clad in hoodies and throwback jerseys, rambling on how hip-hop “died” and how great it was back in the day. But Serengeti has since widened his aim to the character’s inner pathos. He gets drunk at the bar as he repeats ad nauseam, “All I need now is a little clarity.” “Tickled Pink” finds him lost in a haze of pills, rambling about Shaq. It’s a despairing conclusion, but Serengeti/Kenny still brims with confidence as he soldiers through Chicago’s cold streets, “my eyes open, not closed.” Maybe this lovable loser’s embrace of life despite its twists makes him our “Shidoshi” after all.